New at Button Bay State Park this summer will be two new log cabins constructed in the second camping loop overlooking the bay and a beautiful southerly view of Lake Champlain. 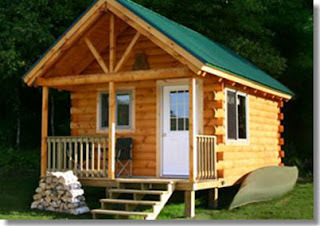 These cabins will be available to rent by the week beginning at park opening. These cabins are cozy one-room units that sleep four people comfortably. Amenities include bunk beds and a futon or sleeper couch (linens and towels not included) a table and two chairs, an electric outlet, a covered front porch and a fire ring with cooking grate. Cooking is done outside (bring your own cookware.) Bathrooms and showers are located within easy walking distance. Get a glimpse of these cabins being built.